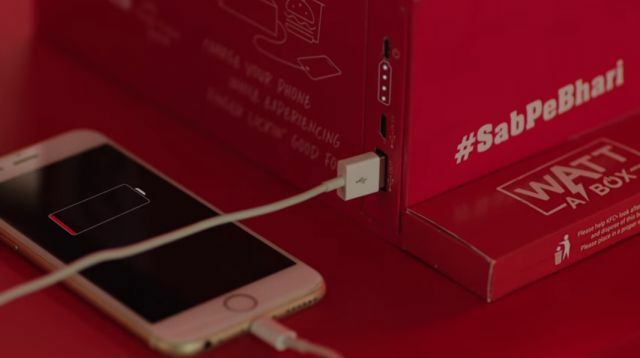 KFC India's latest attention grab is a portable mobile phone battery charger that they've embedded in one combo meal box and are calling the "Watt A Box." The purpose of the concept is that you can charge your phone while you eat. According to Mashable, the Watt a Box comes with "a detachable 6,100mAh Lithium-ion battery, a USB cable for Android phones and an Apple lightning cable for iPhones." The box is assembled in a such manner so that there's an extra compartment for the battery charger where you can still access its two cable ports. They're producing a limited number of the boxes and giving them out via social media to selected people who are referred by a friend as someone who's phone is always out of charge. This isn't the first time that the fried chicken brand has tried embedding/shoehorning technology into its food containers. They've also put out limited edition versions of their signature bucket with a photo printer as well as a voice recorder. While none of these things are very practical, they do generate a good amount of buzz. Although, judging by the number of dislikes on the video, it's not necessarily good buzz.